It is easy, Masonically, to confuse wisdom with knowledge as it is to do so in profane life. Knowledge is the cognizance of facts. Wisdom is the strength of mind to apply its knowledge. 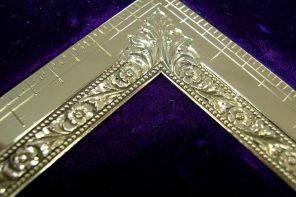 A Mason may know every word of our ritual from the beginning of the entered Apprentice Degree to the final words of the sublime Degree of Master Mason and still have no wisdom, Masonic or otherwise. Many a great leader of the Craft has been a stumbling, halting ritualist; yet possessed in abundance a Masonic wisdom which made him a power for good among the brethren, by whom he was well beloved. Knowledge comes from study; Wisdom from experience. Knowledge may be the possession of the criminal, the wastrel, the “irreligious libertine” and the atheist. Wisdom comes only to the wise, and the wise are ever good. 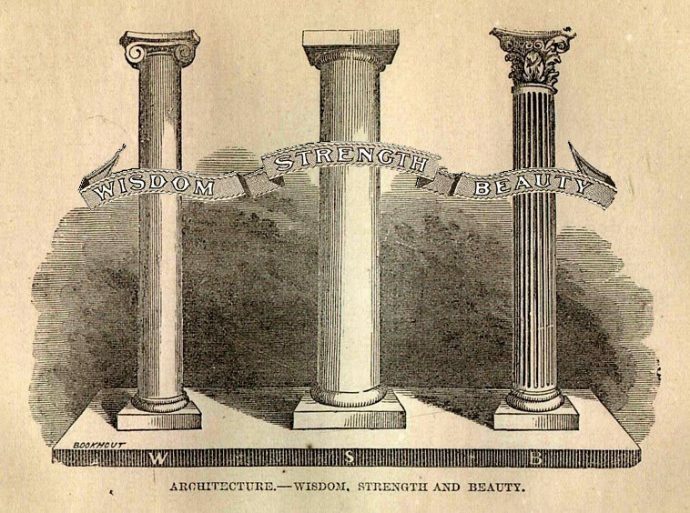 Surely the first of the three grand columns which support our Institution should be taken to heart by every Mason as a symbol of the real need of a brother to become wise with the goodness of Masonry, skilled in the arts of brotherhood, learned in the way to the hearts of his brethren. If he knew not, and asked “how may I gain Masonic wisdom,” let him find the answer not in the ritual, important though it is; not in the form and ceremony, beautiful though they are, and in themselves strong with the strength of repetition and age – let him look to the five points of fellowship, for there is the key to the real wisdom of the brotherhood of man. Strength, the second of our grand columns, without which nothing endures, not even when contrived by wisdom and adorned with beauty, we know in two forms in our daily lives. First, the strength which lies in action, power, might – the strength of the arm, the engine, the army. Second, that other, subtler strength which is not less strong for being passive; the strength of the column which supports, the strength of the foundation which endures; the strength of the principles by which we live, individually, collectively, nationally – Masonically. It is the second form of strength with which the speculative Mason is concerned. Freemasons build no temporal building. True, we do lay the cornerstone of the public building in the northeast corner, but the building is symbolic, not practical. The operative Mason who sets the stone for the grand master would place it as strongly in the building without our ceremony as with it. Our building is with the strength which endures in hearts and minds rather than that which makes the sun – dry materials of which an edifice is composed to do man’s will. The Freemason constructs only the spiritual building; his stone is his mind; mentally, not physically, chipped by the common gavel to a perfect ashlar. The strength by which he establishes his kingdom is not a strength of iron but a strength of will; his pillars support not a wall to keep out the cowans and eavesdroppers, but a character, proof against the intrusion of the vices and superfluities of life. And when thy days shall be fulfilled and thou shalt sleep with thy fathers, I will set up thy seed after thee which shall proceed out of thy bowels and I will establish his kingdom. He shall build a house in my name and I will establish the throne of his kingdom forever. He who reads not merely the promise, but the reason for it, will understand that when David wished to build a house for the Lord, the Prophet Nathan brought him a message of the Lord, that he, not David, will build a “house not made with hands” in the form of sons and their sons forever. Later, in the Great Light, we learn that the house which is “the temple of the holy spirit” is man. If we follow our Masonic teachings, and believe that “the inestimable gift of God to man for the rule and guide of his faith” holds a true interpretation of the Mason’s conception of life and living, the “strength” which Masons should strive to acquire is that which will establish our sovereignty over ourselves, that our kingdom of character may endure. 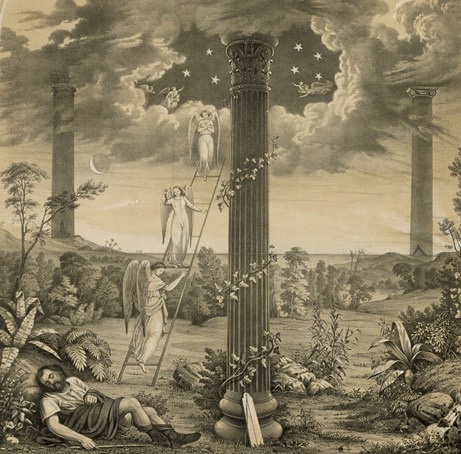 Beauty is represented in a Masonic lodge by the Corinthian column, most beautiful of the ancient orders of architecture; by the junior warden, who observes the sun at meridian when the day is most beautiful; by Hiram Abif, who “beautified and adorned the temple.” We are taught that it is as necessary that beauty adorn all great and important undertakings as that wisdom contrives and strength supports them. In the story of Solomon’s Temple in the Great Light we find detailed descriptions of what was evidently, to those who went into details of its construction; the most beautiful building possible for the engineering skill, the wealth and the conception of the people of Israel of that day. 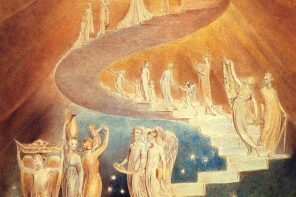 As no two men are agreed as to what is beautiful in a material sense, the Masonic conception of beauty cannot be of a material beauty. Its symbol of beauty – the sun at Meridian – is actually blinding to see. If we think the sun is beautiful, it is, for what it does for us rather than for what it is. All about us, among our neighbors, are examples of what we term “a beautiful life.” Such beauty is almost wholly composed of unselfishness. He who walks in beauty thinks of others before himself, of stretching forth his hand, not for personal gain, but to help, aid and assist the poor and the unfortunate. 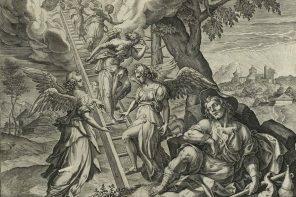 Such a conception of the third grand column is foreshadowed in our teaching that “the greatest of these is charity” – charity of thought, of action, of understanding as well as of alms and of giving. Masonic beauty was wholly an operative matter in the days when the Gothic cathedrals first lifted their arches and spires to heaven. Today, when Masonry is purely speculative, Masonic beauty must be considered only as a beauty of the spirit. A man may keep every law, go to church three times on Sunday, belong to our order and subscribe to every charity; and still be mean of spirit, unhappy to live with, selfish, inconsiderate, and disagreeable. Such a one has not learned the inward meaning of the pillar of beauty. He has never stood, symbolically, in the South. For him, the sun at meridian is but the orb of the day at high noon and nothing more. But for the real Mason, the brother who takes the lessons of the three grand columns to heart, beauty is as much a lamp to live by as are wisdom and strength. He finds beauty in his fellow-man because his inner self is beautiful. His “house not made with hands” is glorious before heaven, not because, in imitation of Solomon, he “overlaid also the house, the beams, the post and the walls thereof and doors thereof with gold” but because it is made of those stones which endureth before the Great Architect – unselfishness, and kindness, and consideration, and charity, and a giving spirit – in other words, of brotherhood genuine because it springs from the heart. For these things endure. Material things pass away. The Temple of Solomon is but a memory. Scattered are the stones, stolen is the gold and silver, vessels cast by Hiram Abif. But the memory, like the history of the beauty and the glory which was Solomon, abides unto this day. So shall it be with our “house not built with hands,” so be it if we build with the Beauty which Masons teach.